Musculoskeletal Ultrasonography - Piedmont Physical Medicine & Rehabilitation, P.A. 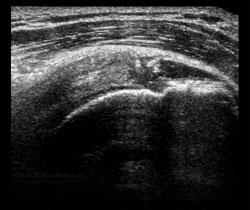 Diagnostic Musculoskeletal Ultrasonography is a useful way to detect problems for muscle, tendon and ligament pain. Ultrasound images are captured in real time, so they can often show movement, function and anatomy, further enabling the diagnoses of a variety of musculoskeletal conditions and assessment for damage to soft tissues after an injury or illness. Ultrasonography involves the sending of sound waves through the body. Those sound waves are reflected off the internal tissues. Special instruments interpret the reflections and create an image of anatomic parts. No ionizing radiation (x-ray) is involved in ultrasound imaging. 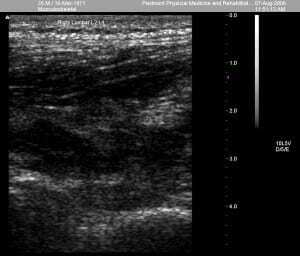 Ultrasound images can be useful in diagnosing tendon and ligament swelling, sprains or tears. Examples include rotator cuff injuries in the shoulder, Achilles tendon tears in the ankle and ligamentous strains in the knee. Abnormalities of the muscles can also be seen, such as tears and soft-tissue masses. 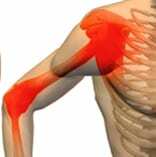 Bleeding or other fluid collections within the muscles, ligaments, bursae and joints can also be detected. The equipment consists of a transducer and a monitoring system. The transducer is a small, hand-held device that resembles a microphone. The sonographer spreads a lubricating gel on the area being examined and then presses this device firmly against the skin. The ultrasound image is immediately visible on a nearby screen that looks much like a computer or television monitor. The images can be captured for storage or printed. Most ultrasound studies are relatively quick and well tolerated by the patient. If scanning is performed over an area of tenderness, there may be minor pain associated with the procedure. Otherwise the procedure is painless. Objectifying the presence of soft tissue injuries with a modality like diagnostic ultrasound is important as it validates the presence of disease or injury. Quite often clinicians dismiss musculoskeletal pain as temporary and make no attempt to ascertain if there is an underlying source that may cause it to become progressively worse or chronic in character. This is a disservice to the patient. While the majority of soft tissue injuries do heal on their own, failure to find out how severe the injury is acutely, or why it has not healed within a 4 – 6 week period of time, can prolong needless pain and suffering and may result in lost opportunities for restorative intervention. 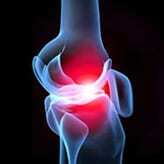 Diagnostic musculoskeletal ultrasound remedies this situation. It also offers the opportunity to locate structural damage that may be the source of referred pain that was otherwise not ascertainable by physical exam alone.